This is the second time I've clayed this blade. On the first quench, it developed a crack and the hamon was a failure, so I figured I'd try it again as the blade is ruined. My experience with hamons is limited to 3 at this point, but I've had the opposite experience with them. When I've used furnace cement, the hamon is almost exactly where I've put the clay. On the first round with this blade, I used satanite and I had a hamon that only covered about a 1/4" of the spine in a straight line. It was clayed very similar the the picture of it now. Holly cow Gene that is one heck of an anvil. Pulled this out of the reject drawer and finished it. It's a blade that I had ground awhile back that had a lot of problems. Got it mostly straightened out. Not perfect but it will make a good user. Glued this one up tonight. I'll finish it tomorrow. Double dyed black ash burl. It's got a lot of color going on. Pulled this out of the reject drawer and finished it. I'm still new but I do want to comment that is one of the nicest handle materials I've seen since I got into this. Glad you were able to save it. Just out of curiosity are those mosaic pins 1/4"? I always thought that sounded too big, but those look just right. I like that mosaic style, too. Edit: just because that second handle material is awesome, too. Just out of curiosity are those mosaic pins 1/4"? Hi soundmind. The handle material is some spalted maple that I purchased at the Arkansas Knife show almost a year ago. The pins are 1/4". On a "hunter" sized knife I don't think 1/4" pins are too big but I probably wouldn't go any larger. I should be able to post the finished second knife tomorrow unless my wife interrupts my plans. . Thanks for the comments. Much appreciated. Well, I was able to get this finished today and have another glued up. Was a pretty productive afternoon. a little file work today to square up the shoulders and the plunge lines. I have some wood picked out for the handle. These traditionally had round handles so I bought a HF wood lathe on sale with a 20% off coupon. I haven't turned any wood on a lathe since 8th grade. It should come right back. lol..
That's coming along nice Boss!! Profiled and drilled holes today in a Bird and Trout knife. This is the one I posted the design of in the design critique thread. I need to tweak a couple small spots, but over all I'm satisfied with it. One possible problem is one pin hole for the bolster is a little close to the edge. I hope it doesn't cause problems. I began to grind in the bevels, but one side started to get away from me. I decided to stop for the night and will take it up again in the morning. spent a little time on my gladious today. I didn't have a wood chisel that would fit into the tang slot on some wood so I had to make one quick and dirty. It worked fine. Good use for the height gage. I had milled and then hand filed the slot to go over the ricasso. This brass piece will be inlayed on the wooden guard shown above. These gages don't get used a lot but when you need one they rock. Day 2 of sick kid. So knocked out a sheath for a friend. Getting all these little projects and oh I have this can you make or fix it for me projects done. @Justin Presson hope the kiddo gets to feeling better. I’ve been sick the last week and a half myself and and it’s still hanging on for dear life! Thanks Daniel I think he is on the mend now. spent a little time today on my Gladious. I trimmed down the front brass guard fixture and inlaid it into the front guard wood. This is still all pretty rough at this point and this wood (thuya burl) really chips out easily. I will definitely pick a more sturdy wood for the next one. This one is just a practice run. I turned down a block on our new HF wood lathe. I haven't turned anything since 8th grade. I'll need more practice on this. Anyway, progress. I still haven't settled on how to fasten it all up on the rear pommel yet. I'm pretty sure I'll weld some thread onto the back of the tang and make it long enough to use a pommel nut. I'm still a newb at the anvil, but as I get more into forging, I am curious about trying an integral from round stock. 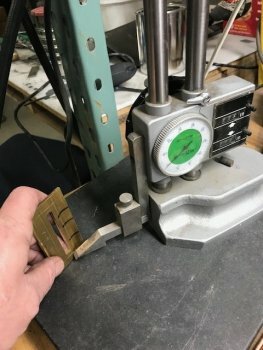 I bought some 52100 round stock from Ray Kirk, but thought I'd practice on some free metal first. I've got a good sized coil spring from a hay baler, not as big as a truck coil spring, but decent sized. I forged it out last night and ground the scale off. Not even sure if I'll finish it, mainly just hammer practice. For the next one, I've got to make a guillotine tool or a spring fuller to isolate that blade, kind of messy with just a hammer. Any advice welcome.